Spotted today at our local store - WOW Mtn Dew - Horde & Alliance. Notice we had to buy one of each. Nate is beyond thrilled (he and dh do play WOW), he has been waiting for this day since he read about this coming out on the market in March. 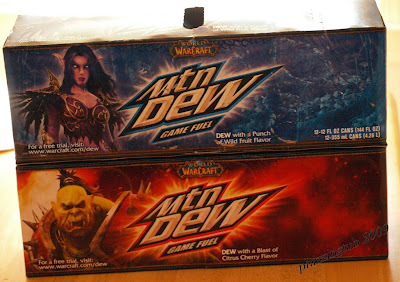 So, if you or someone you know plays WOW you might want to surprise them with a special pack of Mtn Dew.